I definitely do not want to wish the last days of summer away, but I am SO looking forward to fall. Being a former teacher, fall has always seemed to signal a "new beginning" for me, usually meaning a new school year. But two years ago, fall meant a totally different new beginning...it was during that fall that we visited our future hometown for the first time. We were following God's leading to possibly move to Missouri, leaving a city that we loved and moving to a town that we'd never seen. One of the things that I missed when we moved from Virginia to Texas was the beautiful fall. Well, God totally knew what he was doing (doesn't he always?!) when he placed us here during that beautiful fall weekend. The weather was spectacular, even cold for a girl who'd spent over 4 years in Texas, and the trees were amazing. I truly believe that we were here that weekend for a reason. You're probably wondering what all of that has to do with a pillow knock off. I was reminiscing about fall one day, when it was over 100 degrees here, and came across this pillow on the Wisteria website. The price? $89! Isn't it gorgeous? Definitely. But I'm too cheap crafty to spend $89 on a pillow. I actually made a pillow cover to cover up some of my ugly old pillows, but you could certainly use this method to make your own pillow, with a few added steps. To cover an 18x18" pillow, I needed a 19x19" cover (to allow for 1/2 inch seams), so I set about making a pattern that was 19 inches square. I just taped some paper together from my son's scrap box. I liked how the leaf seemed to go over the "edge" of the pillow, so I made my paper 19 inches. This would allow for the design to flow over the edges of the pillow. I am not the best artist and usually like to trace any pattern, but part of the charm of the Oak Leaf pillow (for me) was the organic nature of the leaf. It wasn't perfectly symmetrical, so I figured that I could do my best to recreate it. You'll notice that the leaf is traced in Sharpie...that's because when you use Heat N' Bond to applique your fabric, you need to trace it in reverse. I simply traced the shapes on the front of the pattern so they would show up on the back....then traced the back of the pattern onto my Heat N' Bond. Make sense? I machine-stitched around the acorns and used a "straight stitch" to sew the stems. It's much thicker than a regular stitch and almost looks hand-stitched. One more tip, I actually sewed the details on the leaf while the Heat N' Bond paper was still attached. It makes it much easier to manipulate and it isn't as "floppy". The paper didn't seem to bother my machine, but be careful with yours! This is what the back of the leaf looks like with the paper still attached. The stitches created a sort of perforation in the paper, so it was easy to take off. You might have to work a tiny bit to get the pieces out from under some of the stitching, but it wasn't much trouble at all for me. Now it's time to iron your leaf on! I peeled the paper off, ironed my leaf on, and then machine-stitched around the leaf with the same straight-stitch. If you want to make a pillow, you'll need to cut the same size for the back (19 inches square) and put right sides together. You'll sew almost all the way around, clip your corners, turn it inside out, stuff your pillow, and then stitch the opening closed! I wanted an envelope-style pillow cover, so I followed those steps. There are LOTS of great tutorials for that if you need help. 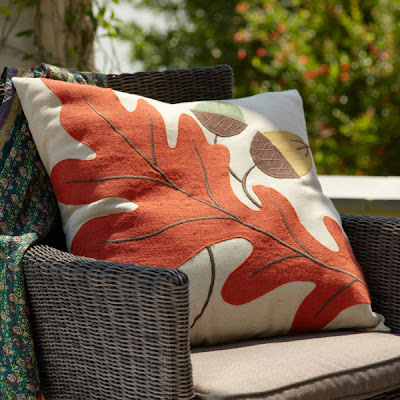 My oak leaf pillow looks right at home on my chippy painted chair on the front porch! Is fall your favorite season? Or are you hanging on to the last bits of summer? Fall is definitely my favorite time too, love the crispness in the air. This pillow is gorgeous, I can not even say how much I love the colors! So adorable! I'm not quiet ready for fall but I am going to keep this project in mind. Love it, I was just looking for a leaf pattern! Love this! I was wanting to do a similar pillow but wasn't sure what technique to use, thanks for the inspiration! So Cute! Very pretty! And that chippy chair is awesome too! I love this project! Thanks for the clear directions and great inspiration! Just saw this on Pinterest and loved it! Thanks for sharing your tutorial on it! Love these pillows. What a great idea. Thanks for sharing the pictures and directions how to make them.